Chateau Latour is like no other Bordeaux wine. It is in a unique class of its own. Chateau Latour has been the most consistent of the First Growth chateaux from the Medoc for over 100 years! Since 1996, Chateau Latour has been producing some of the best wines in their history! Perhaps the best wine produced in modern times is the spell binding 2009 Chateau Latour. The wine is regal. It’s full bodied, powerful, tannic, pure, and sophisticated in its style. Filled with cassis, earth, truffle, spice and tobacco flavors, Latour in the top vintages require decades to fully develop. Once you taste a mature bottle of Latour, you’ll understand why it was worth the wait! 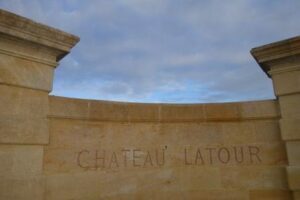 Chateau Latour is one of the oldest Bordeaux wine producing properties in the Pauillac appellation with a history dating all the way back to 14th century! It is thought the original Saint-Lambert tower, giving birth to the name Latour was created in the second half of the 14th century. Documents show, on October 18, 1331, Pons, the Seigneur of Castillon, allowed one of the most prosperous families in the Medoc to create a fortress in area of Saint-Lambert. That design included the original landmark tower that Chateau Latour is famous for today. In 1378, Chateau Latour Latour “en Saint-Maubert,” which was later known as Chateau La Tour and then Chateau Latour, came into being. Because the original Saint-Maubert Tower does not exist today, it remains a mystery. In fact, nowhere on the 1759 cadastre in Chateau Latour, is there any building that looks like a tower. Scholars believe the tower resided on the south-east side of the Bordeaux wine vineyard, near the Juillac river. The old tower was probably square and not round. The existing tower at Chateau Latour, which has nothing to do with the original one, did not give its name to the vineyard. In fact, the tower was a pigeon house, probably built with the stones from the old chateau between 1620 and 1630. At the end of the 17th century, after a succession of sales, inheritances and marriages, the Latour estate became the property of the Segur family. It is in 1718 with the Marquis Nicolas-Alexandre de Segur, that the modern history of Chateau Latour starts taking place. de Segur was the son of Alexandre de Segur de Francs and Marie-Therese de Clausel. Thanks to the marriage of Alexandre de Segur with Marie-Therese de Clausel, “the Tower of Saint-Maubert” entered the Segur family and remained in their hands for almost 300 years. Just before his death in 1716, Alexandre de Ségur bought Lafite. Two years later, his son, Nicolas-Alexandre, (called “the Prince of Vines”) increased the family holdings when he purchased what would later become Mouton Rothschild and Calon Segur. In fact, for a 2 year period, (1718-1720) the de Segur family owned 3 of the 5 First Growth chateaux, Latour, Lafite Rothschild and what we know of today as Mouton Rothschild! 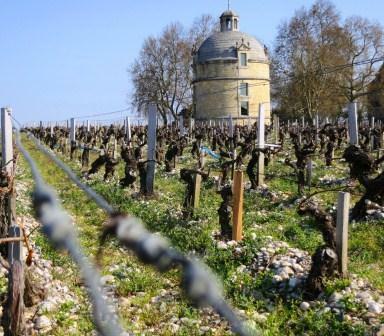 Like most great estates in Bordeaux, the owners did not live at the property, so the management of Chateau Latour fell to a director who produced detailed reports on the estate activity. This organization involved complete administration maintenance, culture expenses and correspondence between the several managers and the owner. This information allows us to understand what really took place at Latour during the last 300 years. By the start of the 18th century, the wine of Chateau Latour was recognized around the world, thanks to the reconquest of the British market and the development of the Bordeaux wine business in northern Europe. The aristocracy and other wealthy groups of consumers loved the Bordeaux wine from the top chateaux, of which Chateau Latour was considered one of the best in the Medoc! That is how Thomas Jefferson, Ambassador of the United States to France and future President of the United States discovered this wine in 1787. To give you an idea of the price of Latour in its day, Chateau Latour was selling more for more than twenty times as much as one of ordinary Bordeaux wines. Classified as First Growth, existing Chateau was built between 1862 and 1864. Skipping ahead, in 1963, the heirs of the Marquis de Segur sold 7% of their shares in Chateau Latour. he new shareholders became “Harveys of Bristol” and “Hallminster Limited”, both British Limited Companies. “Hallminster Limited” belonged to the Pearson Group, and held more than 50% of the shares of Chateau Latour. However the new owners kept the 120 year-old name of “Societe Civile du Vignoble de Chateau Latour”. At the time of the purchase, it was clear to everyone that the Left Bank property needed major renovations in the cellars an the vineyard required serious replanting. In 1963 Chateau Latour expanded their vineyards by 12.5 hectares. They planted two additional plots just outside the “Enclos,” vineyard, which were owned by the property since 1850. This is the source of Les Forts de Latour. In 1968 improvements were made to the vineyard’s drainage system. The wine making facilities were also renovated. Extensive restoration and an extension of the winery at Chateau Latour started taking place in 1964. At the time, a decision was made to replace the old wooden vats with new stainless steel ones. Stainless steel was perfect as it allows temperatures to be automatically controlled by chilled water flowing down along the vat. At that time, it was a revolutionary change in Bordeaux. This was the start of the modern age for Chateau Latour. In 1989, Allied Lyons, already owner of 25% of the shares of Chateau Latour, bought Pearson’s as well as those remaining in the hands of some individual owners to become the majority shareholder. In July 1993 they sold their shares of Chateau Latour to François Pinault for 131 Million dollars. The price turned out to be one of the great deals for a chateau in the history of Bordeaux as the stock in the cellars alone was rumored to be worth close to 60 Million dollars at the time! The next important decision made by Francois Pinault turned out to be equally savvy when he decided to hire Frederic Engerer. Frederic Engerer was already familiar with the Pinault family, as both Engerer and the son of Francois Pinault, François-Henri Pinault attended the same university. Since Frederic Engerer took over management of the property in 1995, things have never been better. In fact some of the finest wines, if not the best wines produced in the history of Chateau Latour continue to be produced during his tenure. In 1998, the chateau renovated their cellars and vat rooms, adding several new, smaller sized, stainless steel tanks to give the estate the ability to vinify on a parcel by parcel basis. It’s possible that stunning 2009 Chateau Latour is at this point, the pinnacle of his success. In 2012, Chateau Latour announced they would no longer be selling Chateau Latour as a future. 2011 was the final vintage they sold En Primeur. Their plans are to cellar the wine until they felt the wines were more enjoyable for consumers to drink. As a guess, it looks like the first releases of the wines not sold as futures will begin with the 2012 vintage in 2022. The 90 hectare Chateau Latour vineyard has 78 hectares cultivated with vines that are planted to 74.2% Cabernet Sauvignon, 23.8 Merlot, 1.8% Cabernet Franc and .02% Petit Verdot. This is a slight change in the vineyard makeup as the amount of Cabernet Sauvignon has been decreased, Petit Verdot is almost invisible and more Merlot has been planted in the vineyards. The Cabernet Franc has also been reduced over the years. However, it is imperative to understand that the heart and soul of the Chateau Latour vineyard, located close to the Chateau is a 47 hectare parcel known as “Enclos”. There are many people in Bordeaux that consider those 47 hectares to be the best terroir in all of Bordeaux. The 47 hectares of vines in the Enclos vineyard remains almost unchanged since 1794. Only grapes sourced from Enclos are used to produce the Grand Vin of Chateau Latour. When you delve deeper into the soils of the Enclos, you find diversity. To the north and south, the soils have more clay and marl. In the center of Enclos, which is close to the chateau, you unearth more deep gravel and clay. This is the section that provides the power, grace and depth of Chateau Latour. The powerful tannins often come from vines planted closer to edge of the Enclos. It is the blending of all these parcels that provide the brilliance of the wine here. Overall, the vineyard of Chateau Latour offers elevations and gentle slopes, easy access to water, due to its close proximity to the Gironde and a terroir of gravel, marl and clay soils with deep deposits of limestone in the soil. Underneath the top soil, you find more gravel, with some clay and sand. The gravel at Latour can run from between 4 to 5 meters deep. The elevations are close to 14 meters at its peak. One can actually breakdown the soils of Chateau Latour into three distinctive types, large gravel stones, smaller gravel rocks or pebbles and clay. Of course it’s the gravel soils that are perfect for Cabernet Sauvignon. But Chateau Latour has a type of clay in their terroir that is incredibly dense called “Argile Gonflante”. You can also divide the Latour vineyard into 3 main parcels, with the largest section placed closest to the chateau, abutting Leoville Las Cases to the south. The Comtesse de Lalande parcel is placed between Pauillac and St. Julien and they own another parcel, Petit Batailley, which is just slightly further inland as is Pinada. They also own vines in a block known as Ste-Anne, which is due west, as well as 8 hectares of vines in a parcel known as Artigues, that is used for their third wine. However, it is important to note that the majority of the Latour vineyards are located to the right of the D2 Highway, providing it better access to the river, which gives it a unique micro-climate. Another important distinction is that the vineyards of Chateau Latour have more slopes with various elevations than any of the other First Growths. The terroir is deep gravel based soils with some clay found in the sub soils. Most of the Merlot planted at Chateau Latour resides in the lower parcels of the Enclos section where the gravel layers are not as prominent, nor as deep. 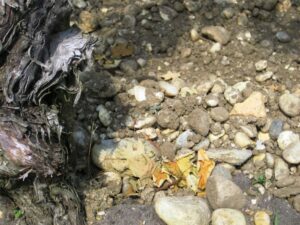 In that section of the vineyard, the marls and clay layers are more apparent in the soil. The small amounts of Cabernet Franc and Petit Verdot in the vines are more likely field blends as they are found inside the vines of the Cabernet Sauvignon and Merlot. On average, the vines are about 40 years of age. But Chateau Latour is fortunate to have old vines as well. Some of the oldest vines at Chateau Latour are over 100 years of age. Those vines, which are all Cabernet Sauvignon, are in a small parcel known as Le Sarmentier. The vineyard is planted to a vine density of 10,000 vines per hectare. Chateau Latour is fortunate to have old vines as well, some of which are close to 100 years of age. The vineyard is planted to a vine density of 10,000 vines per hectare. Currently, Chateau Latour is experimenting with biodynamic farming techniques and sustainable farming in some of their plots. In fact, the number of hectares bio dynamically farmed has been steadily increased over the past few years. As of 2013, 24 hectares were being farmed using biodynamic techniques while 7 hectares are organically farmed. Starting in 2008, Chateau Latour began using horses to churn the soils in select parcels of vines. Currently 7 horses are used to work the Enclos vineyard. Sustainable farming is stressed at Chateau Latour. In fact, to traverse the vineyards, workers often use mountain bikes, to avoid polluting the soils. Starting with the 2015 vintage, the entire Enclos vineyard is farmed using 100% organic techniques and 50% of the vines are being farmed using biodynamic techniques. This means that to fight disease, they rely on a myriad of different plants, copper and sulfur, which are all found in nature. All fertilizers 100% organic. In 2019, the entire vineyard of Latour was certified as being 100% organic. That makes a huge statement in Bordeaux. The best vintages of Chateau Latour are: 2018, 2017, 2016, 2015, 2014, 2012, 2010, 2009, 2008, 2006, 2005, 2003, 2002, 2001, 2000, 1996, 1995, 1990, 1982, 1975, 1971, 1970, 1966, 1964, 1962, 1961, 1959, 1955, 1953, 1949, 1948, 1945, 1934, 1929, 1928, 1926, 1921 and 1900. Chateau Latour has an almost unequaled track record for producing stunning wines that age and evolve for decades, if not generations. While mature vintages of Chateau Latour sell for a lot of money, if you have the disposable income, and want to experience the greatness of an older, mature First Growth, this is the wine to buy. To produce the wine of Chateau Latour, vinification takes place in 80 temperature controlled, stainless steel vats that vary in size from as small as 12 hectoliters up to 164 hectoliters. This range in vat sizes and capacities allows for true, precise, parcel by parcel vinification. The decision as to what specific grape variety or parcel goes into each vat depends on the age of the vines, the varietal and the specific location inside each individual parcel. Malolactic fermentation takes place in vat. Since the cellars were last renovated in 2001, everything in the cellar moves by gravity flow. Chateau Latour is aged in 100% new, French oak barrels, while Les Forts de Latour is aged in 50% new, French oak barrels. There is a second wine, Les Forts de Latour, which comes from the young vines of the Grand Enclos. The vines used to produce Les Forts de Latour are most often at least 12 years of age. Les Forts de Latour made its debut in 1966. However, before 1990, it was only made in a few vintages. Since 1990, Les Forts de Latour has been produced in every vintage and offered for sale as a future. There is also a third wine, Le Pauillac de Chateau Latour. Le Pauillac de Chateau Latour is produced from grapes that were deemed not good enough to be placed in Les Forts de Latour. Chateau Latour was the first property to produce a third Bordeaux wine. This practice was started at some point in the 1970’s. While still not common, today, other properties are following in their lead in both banks. Today, the production of Chateau Latour ranges depending on the vintage and its character. Considering the massive amount of demand, not much is made. On average, between 10,000 and 12,000 cases per year are produced of Chateau Latour Grand Vin, which represents about 37% of the production from the harvest. Production of Chateau Latour has been intentionally declining over the years and the quality, concentration and complexity has been increasing, along with the price. To give you an idea of what has been taking place, the 2000 vintage was the last time Chateau Latour had a large production. In that vintage 15,000 cases were produced. Since that time, production has ranged. For example, in 2003, production was 10,800 cases, 2005 saw 12,000 cases and in 2010 close to 11,000 cases were produced of Chateau Latour. Chateau Latour is not a wine to drink on the young side. The wine is usually far too tannic, powerful and reserved during its youth. Young vintages can be decanted for an average of 3-6 hours, give or take. This allows the wine to soften and open its perfume. Older vintages might need very little decanting, just enough to remove the sediment. 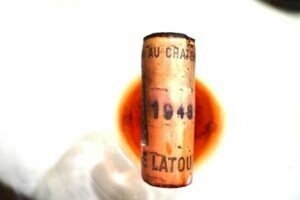 Chateau Latour is usually better with at least 15 years of bottle age. Of course that can vary slightly, depending on the vintage character. Chateau Latour offers its best drinking and should reach peak maturity between 18 and 60 years of age after the vintage. Chateau Latour is best served at 15.5 degrees Celsius, 60 degrees Fahrenheit. The cool, almost cellar temperature gives the wine more freshness and lift. Chateau Latour is best paired with all types of classic meat dishes, veal, pork, beef, lamb, duck, game, roast chicken, roasted, braised and grilled dishes. Chateau Latour is also good when matched with Asian dishes, rich fish courses like tuna, mushrooms and pasta. In 2011, Chateau Latour added to their holdings in Pauillac when they purchased the 4 hectare vineyard of Chateau La Becasse from the Fonteneau family. The vines are used for the production of Forts de Latour. Chateau Latour became one of the first major Bordeaux chateau to embrace anti counterfeiting measures with the use of the Prooftag system which is in place on the label, bottle and capsule of all future and current releases. In 2015, Chateau Latour completed renovations which included new offices, tasting rooms and cellars. 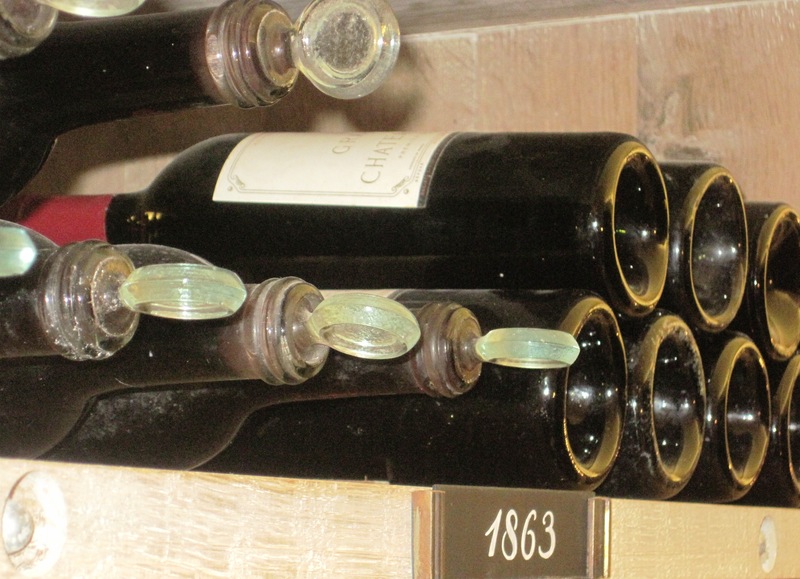 In fact, Chateau Latour became the first estate in the Medoc to maintain a cellar solely devoted to keeping magnums and other large format bottling’s dating back to 1900. 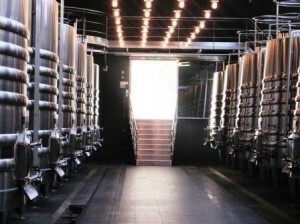 The new cellars were a necessity as they allowed Latour to retain vast stocks of wines, for later releases. The Pinault family also own other wineries through their holding company the Artemis Group. 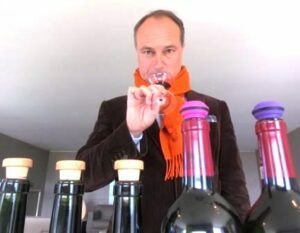 In Burgundy, they own Domaine d’Eugenie, previously known as Domaine Rene Engel. The vines are located in the Vosne Romanee appellation in the Cote de Nuits. Late 2017, marked another addition to their holdings in Burgundy when they purchased Clos de Tart for a record setting price of more than 30 Million Euros per hectare! In the Northern Rhone Valley they own Chateau Grillet, which prior to their recent sale had been owned by the same family since 1830! In July 2013, the family added to their list of vineyards with the purchase of Araujo Estate wines, in the Napa Valley. Araujo has since been renamed Eisele Vineyards. The following year, in 2014, The Artemis Group made their first purchase in the Right Bank, when they invested in Chateau Vray Croix de Gay, Pomerol, Chateau Siaurac, which is located in the Lalande de Pomerol appellation and Chateau Le Prieure in St. Emilion. Showing a caliginous hue, the wine is concentrated, full bodied, powerful, firm and graceful, coating your palate with layers of ripe, sweet, dark red fruits with salty tannins. Even with all the acidity it is impossible not to enjoy the ample sweet fruits, firm, ripe tannins, complexity and incredible length, with purity of fruit, that lingers. It's a Latour that should be a pleasure to taste between 15-20 years after the vintage, which is fine since you'll probably be waiting until 2027, give or take, until it's released. The wine was made from a blend of 92.1% Cabernet Sauvignon, 7.8% Merlot and 0.1% Petit Verdot, reaching 13% alcohol. The harvest took place starting with the Merlot September 11, finishing with the Cabernet October 4. Forest floor, cedar, tobacco leaf and fresh, dark red berries open the wine. Ripe, sweet tannins, juicy, fresh cassis and plenty of fruit and cigar wrapper in the zesty finish to satisfy a discerning consumer. This wine has a lot of lift but the tannins are soft enough, that you should be able to enjoy this in a few years, and it's going to age well too. The wine was produced from blending 65.2% Cabernet Sauvignon, 33% Merlot, 1% Petit Verdot and .08% Cabernet Franc. Each vintage has a signature and this one is a combination of volume, intensity, purity, complexity, freshness and silky, salty tannins. The wine coats your palate with mineral-driven fruit that stays with you for over 60 seconds. The finish shifts from fruit to stone and back to fruit again. This is elegance with refinement and it has the ability to age for decades. The wine was produced from blending 92.9% Cabernet Sauvignon and 7.1% Merlot, reaching 13.5% alcohol with a pH of 3.75. The harvest took place September 22 to September 30 for the Merlot and October 7 to October 19 for the Cabernet Sauvignon. Only 36% of the production was placed into the Grand Vin. Flowery with tobacco, blackberry and spice with an interesting hint of citrus, this is smooth and reserved with a juicy blast of cassis and plum in the finish. Classic but with softness and refinement instead of severity, give this perhaps five to eight more years before popping a cork. Fresh, sweet blackberry and cassis are right out in front. The wine is juicy, fresh, forward and silky. There are ripe tannins, well-designed textures and more fruit than usual for the estate. This should be released in five years for pleasurable drinking. Produced from a blend of 54.6% Cabernet Sauvignon, 38.9% Merlot and 6.5 Petit Verdot, this wine represents 26.5% of the production. Still holding on to its depth of color. The wine already shows some development with its truffle, oyster shell, cassis, Asian spice, dark red fruits and cherry tones. This is a Latour of elegance, purity of fruit and silky texture over power that is coupled with layers of concentrated fruits, and the structure to age for generations. Cigar box, lead pencil, and wet forest floor follow the sweet, dark fruits in the perfume. Your palate enjoys sweet, round, polished, red fruits. The tannin are soft, and so is the texture in the finish. Medium bodied, soft, juicy and sweet, with a real Pauillac character, you can take this home and drink it now, for its soft, sweet, cassis, cocoa, cherry and tobacco character. Showing much better in bottle than it did in barrel, the wine offers a wealth of fruit, which is best described as being regal in character. Yet, as you would expect, most of this stunner is still held in reserve. Freshness, elegance and balance are in charge here. The wine is not about power, it's about elegance, grace and harmony. Nothing is overdone here. It's a great Latour! By the time this is released to consumers, in about 2024 or 2025, it should have added a lot of additional nuances and complexities. Medium/full bodied, focused, refined and needing just a few more years , the cassis is sweet, the texture is polished and the fruit is stained with tobacco leaf. This will be ready to drink in just a few short years. Freshness, elegance and balance are in charge here. The wine is not about power, it's about elegance, grace and balance. Nothing is overdone here. It's a Latour to enjoy in its youth, especially since you'll probably be waiting until 2023, give or take, until it's released. Deep in color, with just a hint of lightness around the edge of the glass, the wine is starting to close down. On the palate the wine is full bodied, rich, refined, polished, fresh and long, with a solid essence of fruit, freshness, volume and length. The tannins are refined and there is the structure to age, but this classic, (in all the right ways) requires at least a decade, and probably longer to come around. This is the first vintage for Latour that was not sold En Primeur. It will be interesting to see what the wine is released in about 2012, give or take. Soft, polished and with a fresh mouth of cassis, the wine is forward and already fun to drink with its spicy, dark cherry and finish center. Quite a strong showing for this wine. Medium/full bodied, and ready to drink, the wine is refined, juicy, elegant, classic and reserved. Yet, the blend of tobacco, cedar and cassis is everything you look for in Pauillac. There is fruit, freshness, and character. You can think of this as a Freshman Latour which drinks well early in life. Medium/full bodied, and ready to drink, the wine is refined, juicy, elegant, classic and reserved. Yet, the blend of tobacco, cedar and cassis is everything you look for in Pauillac. There is fruit, freshness, and character. You can think of this as a Freshman Latour. Fresh, sweet, cassis and cocoa in the nose, the wine is medium bodied with a soft plum and spicy black cherry finish that can be enjoyed young. Blackberry, truffle, tobacco, espresso and cedar wood aromas are easy to find. In the mouth, the wine offers more depth than expected, with multiple layers of sweet black cherries, blackberry and a hint of powdery tannins in the fresh, long, expressive finish. Tobacco, earthy cassis, smoke and an open personality, the wine is polished, soft, sweet and has ripe, sweet, fruits, with refinement in the finish. This is quite enjoyable to drink today. With a blast of black cherry, a hint of oak, fennel and wet earth on the nose, the wine moves to the palate with its soft, open, forward style, offering bright, sweet cherries in the slightly dusty finish. Inky and opaque in color, the wine screams with licorice, truffle, dark black fruits, Asian spice and wet forest scents. The wine is stunningly concentrated filling your mouth, coating your palate and staining your teeth with each delicious sip. There is not a single hair out of place. Everything is exactly where is should be. The sublime finish grows and expands for more than 60 seconds. This wine could possibly outlive anyone currently reading this tasting note! Coffee, oak, earth, blackberry and licorice, the wine is dense, concentrated and lush. There has a strong Pauillac character, with stunning intensity and purity of fruit. With the exception of 1982 and 1990 Latour, this is better than any vintage of Latour between 1967 and 1994. Wow! This is drinking great today. The cassis, blackberry and tobacco charm are out in full force. This has the refinement and character equal to many 5th Growth wines, which is really saying a lot, considering this is a third wine! This has to be the greatest third wine of all time, from any estate! It's soft, ripe, round and stuffed with fresh fruits, spice and earthy characteristics. It's already drinkable too. Riveting! The tannins are pure silk. The wine offers freshness, complexity and concentration with an opulent, powerful, fruit-filled finish that coats your palate with refined textures and an incredible purity of fruit. The finish sticks with you for at least 60 seconds. If you can afford it, this will deliver an unparalleled tasting experience for decades. Compelling in every way... OK, except the price. But price aside, if you're looking at what's in the bottle, this stunner explodes with layer after layer of mouth coating fruits that remain coated over your palate for well over 60 seconds. The style, combining flamboyant, opulent, concentrated fruits and velvety tannins must be tasted to be believed. I'm sure this will be better than the legendary 1982 or 1961 at maturity. That being said, I only wish I would be there to see it at maturity. The wine was produced from a blend of 91.3% Cabernet Sauvignon and 8.7% Merlot , reaching close to 13.7% alcohol, without a touch of heat. The color of dark ink, complex aromas of truffle, cedar wood, cassis, blackberry, blueberry, smoke, cherry wood, tobacco and forest floor fill the air. The wine coats your mouth with pure silk, and velvet intensity. Incredibly lush and opulent layers of sweet cassis, black cherry, plum and blackberry coat your senses. From an assemblage of 91.3% and Merlot 8.7%, the wine reached 13.7% alcohol and was aged in 100% new oak. Beautiful, fresh and pure, with a finish that remains and builds for close to 90 seconds… there was no way on earth I was going to spit this wine out. It was so good; I wanted to cancel my remaining appointments for the day spending the afternoon drinking the entire bottle with some bread and cheese, while peacefully relaxing in their vineyards. And it was only 9:00 in the morning! Lottery winners and multi-millionaires take note, this is the 2009 Bordeaux from the Medoc to buy. And if you’re looking for friends to drink it with, I’m available. This just keeps getting better with bottle age, like all great wines. Full bodied, with rich textures, firm tannins and layers of salty rocks, cassis and blackberries. You can drink this now with an hour of age, or wait a bit. It is difficult to believe this is the second wine, as it's better than many Classified Growths. Full bodied, round, plush and polished, with a real freshness to the fruit along with richness and concentration to all the wine to expand and longer. The aromatics are equal to the mouth feel. Still young, this will add more complexity in the years to come. I've tasted this wine a few times since it was first shown in barrel and this is the best showing yet for this vintage. It's amazing to consider, but this is a better wine than Latour produced in many vintages during the 80's and 70's. Blackberry, smoke, wet earth and wood scents open to a sweet, ripe, lush, round Pauillac filled with juicy, crisp cassis and blackberry. From a blend of 65.1% Cabernet Sauvignon, 32.3% Merlot, 1.9% Petit Verdot and a tiny bit of Cabernet Franc, the wine reached 13.5% alcohol. This wine is better than many vintages of Chateau Latour produced in 80’s and early 90’s. Forest floor, cedar and cassis in the nose opened to a soft wine with ripe, tannins and a true Pauillac character. The wine finishes with pure blackberry essence. For a third wine, this is quite an achievement. There is a lightening in the color, giving a slight bricking effect. The wine is as concentrated as it is tannic. This is still youthful, fresh and holding on to most of what it has to offer. There is definite power here, and layers of ripe, juicy, dark, red berries. Clearly this wine has improved over the decade, as you would have expected. But it is still on the young/semi-strict side, so you should wait another 10 years or more. Utilizing only 40% of the harvest for the Grand Vin, the wine was made by blending 94% Cabernet Sauvignon, 5% Merlot, and 1% Cabernet Franc. Earthy, with wet forest floor, tobacco, spice and red fruits at its center, the wine is full bodied, showing soft tannins and spicy, red fruits and cigar wrapper in the finish. This is drinking great today. Fully mature, the truffle, and tobacco notes come through loud and clear. Medium bodied, still holding on to its red fruit core, this will be best over the next few years. Firm style of Latour with a strictness to the tannins. Full bodied, powerful, tannic, youthful and concentrated, the fruit is fresh, ripe and out in front, but this needs another 10-15 more years before the tannins soften and it becomes fun to drink. My instincts say this will probably always retain its firm style, even when mature. This is not a bad thing, it's just a stylistic preference. Spicy cassis, confiture, tobacco, cigar wrapper, oyster shell and cedar wood in the nose. Concentrated, full bodied, fresh and still youthfully tannic. There is more than enough fruit to take over the tannins, instead of the other way around. That being said, if you only have a bottle two laid away, I'd wait another decade before discovering more of the fresh cassis, spice, and sweetness in the wine. The finish, while elegant is still tanninc, but the length is hard to deny at close to 50 seconds. Spicy, tobacco, smoke and fresh fruits in character, with only a bit of tannin remaining to resolve. The wine is fresh, with a vibrant quality to its personality in the finish. Powerful, tannic, bold, firm and structured, this is perhaps the quintessential example of the fist inside the iron glove. This is incredibly powerful, focused and precise. It's also quite structured, dense and tannic. With a depth of color that still looks young, with coaxing you find, tobacco, cigar box, cedar chest, forest floor, smoke and caramel notes in the nose, but it takes effort to find everything at 10 years of age. The wine is powerful, tannic, full bodied, young and mouth filling. The wine offers concentration, intensity, length and refined textures, but if I gave the impression it’s ready to drink, it’s not. It’s more serious than fun to taste today, so give it time and air. From a blend of 87% Cabernet Sauvignon, 12% Merlot and 1% Cabernet Franc, the wine reached 13.5% alcohol and was produced from just 44% of the harvest. Better than when tasted, this stunner, produced from a blend of 87% Cabernet Sauvignon, 12% Merlot and 1% Petit Verdot serves up a nose packed with earth, smoke, blackberry and espresso bean. The wine is powerful, dense, refined and youthful. It really packs a mouthful of flavor and intensity in every sip. This really coats your mouth with flavor. Layer after layer of sweet, fat, ripe, juicy fruits, plush, soft tannins, licorice and silk seem like they never leave your palate. This is intensity paired with purity, concentration and complexity at its best. In a few years, OK, more than a few, perhaps a decade or two, this should really hit its stride. The wine really leaves a lasting impression. From a blend of 87% Cabernet Sauvignon, 12% Merlot, and 1% Petit Verdot, only 44% of the harvest was placed into the Grand Vin. FWIW, this was tasted blind.Note to self, remain friends with people who have this elixir in their cellar as I really want to taste this when both, the wine I, are mature. Comments not needed on which will mature first. Produced from blending 76% Cabernet Sauvignon and 24% Merlot, the wine reached 13.2% alcohol and represents 45% of the production. Ruby in color, with cedar wood, earth, forest and blackberry, the soft, fresh, cassis filled wine is medium bodied and ready for prime time drinking. Surprisingly woodsy, with truffle, cassis, earth, tobacco, cedar chest and blackberry in the developed nose. There is a nice softness to the tannins and fruit. Not yet fully mature, but quite developed for a vintage of Latour at 10 years of age, the wine offers pleasure, refined textures, balance and sweet berries in the finish. Drink now, or wait 5 years for more complexity. Smoke, cassis, earth, spice, cedar and tobacco create the youthful aromatics. The wine is soft, lush and round on the palate, finishing with ripe, spicy cherries, cassis and hints of jam. While it was interesting to taste young, I'd give it another 5-10 years before popping a bottle. An expressive nose filled with smoke, cassis, BBQ, cedar wood, anise, dark berries, chocolate and black cherries grab your attention. With these complex aromatics and lightening in the color, this Pauillac seems to be evolving at a rapid pace for Chateau Latour. The wine ends with gentle layers of cassis and black cherry with a touch of tapenade in the rich, elegant finish. This will drink early for Latour. While it can be enjoyed today, unless you're sitting on more than a case, or prefer wines young, another 5-8 years will add a lot of complexity to this charming Bordeaux wine. Truffle, smoke, cigar box, cassis, cedar wood and wet earth explode in the nose. The wine is fleshy, rich, plush, round and mouth filling, with concentration and complexity. The silky, smooth tannins and palate staining levels of fruit feel older than their true age, but there is so much going here, you barely notice. This has for me, been the most perplexing vintage of Latour. Some bottles have been off the charts. Other tastings have been shorter and drier. Fortunately, this bottle was on target, firing on all cylinders with its salty, fresh blackberry, cassis, truffle, cedar and tobacco filled personalty. Rich, dense, showy and long, the wine really leaves an impression. Dark in color, with a flamboyant nose of licorice, espresso, blackberry, jam, earth, plums and spice in the nose. Rich, full bodied, fat, deep and intense, with air the wine continued to soften, becoming, silky and exotic in texture. You can sense the alcohol, but there is such a wealth of fruit and ripe tannins, it does not matter, the lengthy finish fills your palate. 2003 Latour is a bit of a head scratcher. I’ve tasted this wine at least half a dozen times this year, with varying results. Some bottles like this wine have been stunning. Others have been much drier and more austere on the palate. This note is for the best bottles. Inky in color with intense aromatics of black raspberry, cassis, cedar, anise, truffle, chocolate and mint. Rich, intense and concentrated in the mouth. The long finish coated your senses. This is a stellar wine! Exotic, amazing depth, intense purity, opulence and balance. The layers of powerful yet silky, dark fruit must tasted as well as felt to be belived in this classic Bordeaux wine. The seamless fin ish lasts well over a minute! Soft, sweet, lush and fully developed, this blackberry, earth and plummy wine is round, open and accessible, with lots of spicy, earthy dark red cherries in its core. However, this is not a wine for aging, it’s already delivering most of its charm today. With a nose filled with walnut, cassis, tobacco, blackberry and forest floor aromas. The wine is medium/full bodied with a refined character. The finish is all about the sweet, lush rich, balanced textures and classy, stylish cassis. The wine of the vintage opens with a smoky tobacco laden nose complicated by gravel, cassis, spicy black cherry, forest floor, Asian spice and hints of espresso bean in the nose. On the palate, the wine is full bodied, with ample levels of spicy cassis, round tannins and a long, fresh, expansive, spicy, black and red fruit, filled finish. A lot of charm in every sip is the right motto for this wine. It's elegant, fresh, supple and round. The fruit is vibrant and refined, with a sweet, soft, pure, dark red berry core. I liked this a lot and expect to enjoy it even more with additional bottle age. It's fair to say this is a lighter style of Latour. Yet, there is still a lot to like about the wine with its stylish, purity of fruit, elegant textures and refined, mineral driven personality. More focused on freshness and purity than power, for Latour, this will be a wine to enjoy on the early side. I'll start popping mine in 2016 and enjoy it for at least 20 years after that. Medium/full bodied, with a refined, elegant nature, for Latour, it’s on a rapid course of evolution. The wine is fresh, clean and pure, with layers of rich, spicy black cherry, tobacco, smoke, gravel and truffle. The soft, round tannins and regal, crisp finish are a pleasure to taste and feel. Spice, cedar and cassis with hints of tobacco make an attractive perfume. On the palate, the wine is not going to win awards for concentration. The quality of the fruit is very classy and stylish. But, for a First Growth, I wanted more. Today, the 02 remains my favorite current vintage. It is a stunning wine as well as a very good Latour. The 01 is surprisingly mature for Latour. Mind blowing levels of concentration, perfectly ripe tannins, textures that feel like polished velvet and a finish that coats your palate for close to 60 seconds. Make no mistake, this is a baby. But what a beautiful baby it is. I'm sure this could easily offering stunning drinking for 60-70 or 80 more years. 2 hours of decanting helped the wine fill out, but another 10-15 more years is where the additional nuances kick in. Breathtaking is good place to start. The velvet drenched fruit has a purity and freshness to its character that is hard to forget. Power, purity, balance and refinement, with the potential for decades of aging and a finish that sticks for more than 60 seconds is in every sip of this elixir. If you are lucky enough to have a few bottles, waiting until 2025, or 2030 is in your best interest. If you cannot keep your hands off a bottle, and you really want to pull the cork, give it 2-3 hours of air and enjoy the ride. If you're in the neighborhood and you need someone to share it with, please drop me a note! Young, tight and vibrant, the wine needs air and coaxing to show. With effort, fresh blackberry, black pepper, cassis, smoke, earth and cigar box aromas make their presence known. Full bodied, deep, concentrated and tannic, the finish is long and fresh The wine needs perhaps another decade in the bottle before its refined, powerful, regal character truly expresses its essence. This is everything a great Pauillac should be. It takes immense concentration of favor and combines it with palate staining, fresh, pure fruits, refined, silky tannins, attention grabbing aromatics and a long, intense finish that seems to last close to 60 seconds! Produced from a blend of 77% Cabernet Sauvignon, 16% Merlot, 4% Cabernet Franc and 3% Petit Verdot, if you have the money, this is the wine to buy. Deep in color, it looked like a wine half its age.The nose took effort to wake up, before scents of tobacco, coffee bean, licorice, earth, blackberry, truffle, cigar box and wet earth made their presence known. On the palate, the wine is rich, deep, full bodied and offers a beautiful sense of purity of fruit, supple textures and a long, rich, expansive finish. If you can wait, I'd give it another 15 years, if you need to see what it's about today, give this stunning wine a few hours of air. While this is shockingly expensive, if you have the money, it will be a future legendary vintage of Chateau Latour. On rare occasions, the best wines leave you speechless. Words are a waste of time. It quickly becomes obvious that your time is better spent enjoying the experience of the wine you are drinking. That is exactly what happened with the 2000 Chateau Latour! With an intense perfume filled with earth, cedar chest, stone, creme de cassis, cherry pipe tobacco, licorice, blackberries, Asian spice and lead pencil, the wine got off to a good start and kept on going!In the mouth, countless layers of voluptuous, pure, dark fruits melted over your palate. The concentrated, perfectly constructed, seamless finish was packed with pure, dark fruits. Everything was in harmony. The wine remained on your palate for at least 60 seconds! One of the unique characteristics all great wines share is, they show beautifully, even when they are young. While incredibly expensive, if you have the money, or a few bottles packed away in your cellar, this is a remarkable Bordeaux wine to mark time with. This was filled with cassis, minerals, toasty oak, tobacco, spice and ample layers of ripe black fruits. Rich, concentrated and filled with depth, the wine offers beautiful purity. Everything is in balance while the wine fills your palate with flavor. The long finish is round and complex. With more bottle age, this will only get better. With its, black fruit, cassis and leafy aromas was ready to drink as the tannins seemed resolved. Clearly, this is ready prime-time drinking, as it has hit maturity. Elegant, refined, soft, graceful and focused on its sweet, ripe, fresh, red berries, most of the tannin has resolved. The nose is as charming as the palate. This medium-bodied silky expression of Latour will be at its best over the next 12-15 years. If you have a bottle, and you are in the mood for a Latour, now is a good moment to pop a cork. This medium bodied wine from the legendary First Growth is a good wine, but it's not going to be confused with a great vintage of Latour. Medium bodied, polished, pure, clean and forward, the wine is displaying some secondary characteristics at this point. While there is no hurry to drink it, I doubt that holding it is going to create a miracle in the bottle. From a blend of 70% Cabernet Sauvignon, 25% Merlot, 4% Cabernet Franc, and 1% Petit Verdot, this wine was a nice surprise. Previous tasting's showed a wine that was charming, but light. The past few years have been good to this wine. Ruby in color with definite lightening at the edges, scents of tobacco, stone, earth, black cherry, kirsch, cedar wood and cassis lead to a medium/full bodied wine that for Chateau Latour is remarkably forward. Soft, refined and elegant in nature, this delicious wine ends with a supple, spicy, black and red fruit filled finish. This could improve a bit, but this is not a wine to age for decades. Medium/full bodied, better on the nose, with its tobacco, blackberry, cassis, spice box, tobacco, cedar chest and oceanic nose, than on the palate, as it lacks the generosity, depth and breed found in the best vintages. Still, there is a classy air to the character, and the ability for further development, which might turn out a little bit better with another decade in the cellar. A little more air would have added more to this stunner. Still, it would be impossible not to grasp the power, refinement, purity and length. This is the perfect blend of stoicism, firm tannins and regal fruit and textures. This bottle seemed younger than previous examples. Perhaps as mentioned, more decanting would have added to the experience. This is really in the perfect spot, where it will reign for decades. This has it all. The cool, detached power and elegance that comes from Pauillac. Ripe, dense, complex, yet regal, in a kingly manner. The tannins are present, but they are soft. The fruit has an earthy, spicy quality, with a hint of salt, of minerality in the long, expansive, fruit, earth and rock filled finish. 90 minutes or so of air helped the wine soften and fill out. I love this wine! If you like the wines I like, that should say it all. But for those that like a bit more detail, while not mature, it's drinking great today. The wealth of fruit, elegant refined tannins, purity of fruit, balance, harmony, length, concentration and complexity are almost off the charts. Drink this now, or wait 20-30 years, either way, it's sublime! This could hit triple digits some day. It's a truly stunning vintage for Latour. It's completely filled with lush, elegant, sweet, perfectly ripe fruits, silky, powerful, regal tannins and a finish that does not quit. I enjoyed drinking it as it approaches its 20th birthday. Meaning, it's more than fine to pop a cork today. But if you can wait another decade, this will be one of the best wines you're ever going to taste. Young, but oh so good. Power, elegance, refinement and sensuality combine to produce a wine that gabs you, and does not let go. With about an hour of air, the wine started to get going. I'm waiting on my few bottles for at least 4-5 more years. This should easily offer great drinking for 50 years. This is a stunner. If you have the money, run, do not walk and buy this majestic elixir. The fruit is perfect, mouth filling and palate coating. The tannins are soft, silky and refined. There is so much of everything going on in this wine, it knocks on the door of almost too much of a good thing. The wine was produced from a blend of 78% Cabernet Sauvignon, 17% Merlot, 4% Cabernet Franc and 1% Petit Verdot. Absolutely stunning in every way. The nose grabs you with its earthy, spicy, tobacco and cassis perfume and never lets go. On the palate, this is even better with its long, lush, polished, deep fruits and silky tannins. Drink this young if you like plush primary fruit, or age it for 2 decades for secondary characteristics. Expensive yes, but it is the best deal for a high quality Latour in the market today. WOW! The tannins are soft, ripe and starting to integrate with the powerful, elegant, silky, refined character. Rich, dense and concentrated, there is a great depth of flavor found in the long finish. Great wines almost always show well young. But this is only starting to deliver its essence. In 10, 15, 20 or 30 years, this will only be better. Richly colored, the wine is deep, powerful, intense, concentrated and packed with layer after layer of juicy, ripe, sweet, pure Cabernet Sauvignon and polished tannins. The long, velvety, fruit drenched finish must last at least 60 seconds! This was about $125 as a future. I remember how shocked people were at the time as well. Glad I bought some! The first great vintage produced after Frédéric Engerer joined the property, the nose explodes with wet forest floor aromas, smoke, tobacco, cassis, spice box, cedar chest, cigar wrapper and licorice aromas. Full bodied, rich, intense, concentrated, refined and powerful, with 2 hours of decanting, the wine continued to expand and add layers of complexity in the glass throughout the night. This graceful wine can be enjoyed now, but its best qualities will take at least a decade or more to come around. 1996 Latour offers a complicated nose of truffle, licorice, tobacco, cassis, cloves, cinnamon, cocoa, cigar box, cedar chest, black plums and ash. The perfume gains additional layers of fragrances with each swirl and sniff. This Bordeaux wine is perfectly balanced, harmonious and intense. Full bodied, rich and concentrated with pure dark, spicy fruits, this is easily described as power blended with elegance. The seamless finish ends with countless waves of ripe, cassis, spice and blackberry. While already approachable, this stunning wine will continue evolving and improving for decades.Sonia from Latour made the perfect comment about the wine saying, “The 96 Latour speaks to you for hours, meaning the wine develops well in the glass and continues offering new aromatics with each breath you take of the perfume.” She was right. The nose is developing nicely with its tobacco, smoke, cedar chest, earth, mint, blackberry and stone profile. The wine is powerful, fresh, long, structured to age and tannic, finishing with a powerful, clean, black cherry and cassis finish. In 2013, 1995 Latour was the first in a series of vintages to be re-released by the chateau after they announced the wines would no longer be sold as a future. The wines are differentiated by the anti counterfeiting measures on the label, bottle and capsule. A powerful nose filled with licorice, creme de cassis, truffle, forest floor, blackberry, cigar leaf, cedar wood and gravel greets you warmly. Full bodied, tannic, concentrated and rich, this intense Pauillac is still young and fresh. With round tannins and layers of ripe, black fruits with cassis, the wine remains on your palate for over 40 seconds. 1995 Chateau Latour is probably the wine of the vintage. While this is approachable today, it will drink much better starting in 2020. Firm, with a sense of rusticity to the tannins, the red and black fruits have a crispness, while the nose and finish share a leafy, tapenade character. The nose is the best part of the experience. It's a nice enough wine, but not a great Latour. The wine was produced from a blend of 68% Cabernet Sauvignon, 27% Merlot, 4% Cabernet Franc and 1% Petit Verdot. This represents the most Merlot ever used in a vintage of Latour. Firm, structured and austere, the wine is filled with cassis, tobacco, olive tapenaede and earthy scents. But the stern personality and hints of green flavors intrude on the experience. In 1994, the estate added 27% Merlot to the blend. With an abundance of Merlot, I was expecting a rounder wine. For Chateau Latour, 17 years is still young and while it might improve, but I'm not holding my breath. Displaying a delicate fragrance of truffle, earth, forest floor, tobacco, strawberry and kirsch, this light style of Latour is fully mature and will not improve with additional cellaring. Even though this was from a magnum, interestingly, it seemed softer, more approachable and even more open than some bottles I've tasted from a 750. On the way to silky in texture, the wine showed loads of ripe, round, sweet, fleshy fruits with soft tannins and freshness in the spicy, cedar and tobacco leaf filled, red berry finish. At close to 30, if you are holding this in your cellar, it is a good tie to start popping a cork. In magnum, there is an extra level of depth, refinement and pleasure I have not seen in regular bottles. It takes some coaxing, but all the tobacco, wet earth, cedar, dark red fruit and spice comes out. Full bodied, fresh and vibrant, at 27 years of age, this is really drinking well. But if you only have a bottle or two, and you're the patient sort, if well stored, it will be even better at 37! Drinking well, it takes little effort to discover the tobacco, cassis, cedar wood and earthy charms. Refined, and in between tannic austerity and elegance, the spicy, red fruits in the fresh finish pack a nice punch. This is a very good Bordeaux, but for Latour in a great vintage, it is missing that little extra something. A good, but not great Latour, that is better on the cigar box, tobacco, cassis, cedar, wet earth, blackberry and spicy nose, than on the palate, where it should shine. Still young, this will improve for years. One of the best bottles of 1990 Latour I recall having, with its showy notes of clay, black and blue fruit, smoke, earth and spice filled cassis. Powerful, soft and fresh, the wine is long, deep and complex. A very good, but not great Latour that is developing at a rapid pace. Rapid for Latour. The tannins are soft, the nose is complex, the fruit is ripe, but intensity and concentration found in the great years is missing. There is some bricking in the color, which is a surprise for a young, vintage of Latour. The nose offers cigar box, smoke, cedar wood, licorice, jammy plum and cassis aromas with hints of wild strawberry. The wine is full bodied and concentrated, but it is developing at a rapid pace and might not be a wine for long term aging. The polished, soft, potent finish is a treat. An interesting vintage of Chateau Latour, the wine clearly has its peaks and valleys along its evolutionary curve. Fortunately, at this tasting, it was having one of its good days with a perfume marked by a spice filled nose, coupled with wet earth, smoke, tobacco, caramel, tar, cassis, blackberry, hot bricks and cedar wood. Big, powerful full bodied and still youthful, the wine demands another decade for the ample tannins to further integrate into the rich, black and red fruit filled finish. With a classic cedar, cassis, gravel, tobacco, earth, herb and lead pencil profile, this big, powerful, tannic, full bodied Latour wants to strut its stuff. Decanting is needed before it begins to emerge. There is a masculine quality to the wines character. It's a bit on the firm side. There are tannins that still need to be resolved. It needs another decade before we can know for sure what type of vintage 1990 was for Latour. Cassis, blackberry, grilled nuts and cedar sparked the aromatics. Still tannic. Needs time. When tasting it, I commented how much it reminded me of the Las Cases. As they are neighbors, that is easy to understand. On the palate, the wine offers a lot of ripe juicy, Cabernet fruit. While stylish, it comes up short for the vintage and a First Growth. The finish and middle are shorter than I'd hoped. This will improve, but IMO, as good as it is, it's not at the top level Latour is producing today starting with the 95. Young and primary. This deeply colored wine had aromatics of smoke, cassis, coffee, walnuts, forest and eucalyptus. Dense, tannic and chewy, but not overly complex or deep. Cassis, walnut, maple, tobacco and earthy aromas are at your service. Classy, layers of ripe fruit end in a long cassis filled finsih. While young and primary, it had it all. It was also shut down hard, but you could catch glimpses of its future greatness. Cassis, lead pencil, blackberries and oak were part of the perfume. This wine is huge, complex and very extracted. The palate is overtaken by layers of ripe fruit that awakens your taste sensors. Very tannic. I wouldn’t be surprised if this wine took 15-20 years to fully blossom into maturity and lasted another 30 years after that. Tangy fruit and medium bodied with more power, depth and complexity on the nose than on the palate. The fruit has a regal quality in its cassis character, but the finish has some dryness and is far too short for a First Growth, especially in a good vintage. Traditional and classic in style, this medium bodied, elegantly styled wine lacks the depth, weight and complexity expected of a First Growth, especially considering the quality of the vintage. The wine offered freshness coupled with complexity in the nose, along with soft textures showing its class, but the short finish and lack of density stops the score from going higher. Fully mature, with tawny edges to the color, this is a medium bodied, finesse styled vintage of Latour. There is a silky, elegance to the wine, but it lacks the level of concentration needed to add to the cassis, truffle, cranberry, earth, tobacco, cigar box and spicy, blackberry character. There is no hurry to drink the wine, but I’m not sure there is any reason to wait for further development. This expressed a perfume of blackberry, cassis, mocha, truffle, spice, rhubarb, and earth. Light in weight for a Latour from a top vintage, this wine is fully mature and should be enjoyed sooner, rather than later. This wine, with its cassis, black fruit, spice and tobacco nose is already very open. While elegant and with some complexity, this is light for a Latour from a good year. The wine has reached maturity and should be drunk up. With a perfume of blackberry, cassis, mocha and truffle, this tannic, medium weight Latour finished with spicy Cabernet. Tobacco, earth, cassis and spicy aromatics are the first thing you notice. The wine has a rustic feel in the mouth. It is solid and four square in style, finishing with cassis flavors. This will last, but I am not sure it's going to improve. This is a flawed wine that continues getting worse with age. Very disjointed. It is a failure for a vintage where Cabernet excelled. "Sell Mortimer, sell". This gets worse with every bottle I taste or suffer though. What were they thinking? In a year where Cabernet based wines are for the most part, some of the most compelling drinking experiences around, Latour struck out. It was tart and the elements just couldn't seem to come together. Cassis, baked red fruits, tobacco and earthy scents opened to a medium bodied wine that ends in a light, red and black fruit finish. The wine started off with a tart side and with time in the glass began to improve. Still, it’s a disappointment for Chateau Latour and the vintage. Much better than expected, the wine shows the patina of age in its brick laden color. Tobacco, wet forest forest, cedar and cassis scents made up the aged, but not complex perfume. On the palate, the medium bodied fruit was classy, but the finish was far too light and short to retain your interest. Drink up, it is not going to get ever get any better. Stunning from top to bottom, and from start to finish, this is a strong contender for wine of the vintage. With mouth coating layers of dark red fruits, tobacco, cigar wrapper, cedar wood and smoked earth aromatics, the wine kicks off with all the right stuff. But it is on the palate where the wine is really on full display. Intensity, length and regal in character, there is a firmness to the structure along with elegance and formality in the finish, which by the way must stick with you for 60 seconds! Thank God I have friends that can afford this. Because it really is a benchmark wine that at close to 30 years of age is almost in the right place for prime time drinking. Well stored bottles should offer pleasure until 2082! Words cannot do this justice. The wine is incredibly concentrated, powerful, rich and yet, firm, regal, refined and elegant. At a tasting of close to 20 different 1982 wines, this was the wine of the tasting! And that is saying something. The intensity found here, does not quit! There is layer after layer of depth. On the palate, the wine just keeps on going and never quits. Freshness, kingly refinement length and expansiveness are all part of the game. Popped and poured, decanting would have helped. Further cellaring would assist as well. I am sure future generations with well stored bottles, especially in magnum with be drinking this until it's at least 75 years old, or longer! This wine can be perfection in a bottle. Sadly, while this was close, with its heady perfume, full bodied, concentrated palate presence, it was no cigar. Freshness, layers of perfectly ripe, juicy, cassis, tobacco, cigar box, ash, earth and cedar, at close to 40, this will easily go another 40 years. I wish I showed as young as this wine! This is so good, the scale should be adjusted to allow for 101 Pts! This is everything a great Bordeaux needs to be with its majestic blend of silk, velvet and power. The exotic nose is compelling, with its cassis, blackberry, tobacco, earth, cigar box, cocoa, and dark chocolate nose. But the real action takes place on your palate. Layer after layer of perfectly ripe, sensuous, powerful fruit coats your palate and stays there, lingering and expanding for over 60 seconds. This was a very good bottle of a great wine. The experience can be much better, which is saying something, since this was so good. With a nose of fresh herbs, cedar chest, forest floor, cassis, tobacco and spice, the wine is rich, full bodied and filled with fruit, earth and powerful, sensuous textures. There is the perfect blend of silky tannins and power. This is elegance at its best. Great wines are going to be different in character, but they are not going to get better than this. The wave of fruit that drenches your palate is packed with polished, elegant, lush berries. The nose is a turn on and the finish last over 60 seconds. To use a quote from one of my favorite movies; "The Maltese Falcon," "This is the stuff dreams are made of." This is the wine of the vintage and one of the wines of the century. As good as it is now, it's almost scary to think how good 2009 could turn out when it's the same age. I am not sure how it happened, but I was able to taste this wine twice in the same month and a third time, not that long ago. I know how lucky I am. However, the point of this is to state that on each occasion, the wine was easily at triple digits in quality! It is remarkably consistent. To plagiarize myself, if aliens came down to earth and wanted a wine to take back to their planet, this is the wine. With textures of refined sensuality, the wine is opulent, flamboyant and exotic. The perfume screams the moment the cork pops with its tobacco, truffle forest, spice box, cigar wrapper, incense and black cherry liqueur notes. The finish builds and expands for over 60 seconds! This is the wine I'd buy, if I hit the lottery tomorrow. If a wine deserved more than 100 Pts, this bottle was a contender for that honor. One of the clear indicators for a sublime wine is, it starts off great and continues improving and keeps on getting better than you could have imagined. This bottle of 1982 Latour was all that and more! Tobacco, earth, truffle, wet gravel, cassis, blackberry, cedar and spice box was elevated to new level. The intense, perfectly balanced, potent, mouth filling waves of fresh, ripe, pure flavors expanded on your palate for over 60 seconds! Silk and power, with everything in perfect balance and harmony. The wine continued to improve in the glass for hours. This is what great Bordeaux is all about! This was one of those bottles that you remember forever. With its intense aromatics and incredible concentration, it said hello and kept on talking. Deep, powerful and complex. This has a wonderful purity of fruit and the finish seems lasts over a minute. Olives, black cherries, herbs, coffee, cassis, minerals and tobacco take over your senses. Still young and concentrated, this powerful, concentrated wine is not close to full maturity. It could outlast most people who own the wine today. “Oh My God!” This is the type of Bordeaux that brings tears to wine lovers eyes! This was so good, words alone do not do it justice. This amazing wine exploded with a myriad of scents including pepper, walnuts, spice box, cassis, cinnamon, licorice, coffee, truffles and more! And that was the beginning! The palate presence was out of this world! This is so opulent, exotic and rich, it has to be tasted to be believed. The perfect, seamless finish was breath taking filling every nook and cranny in your mouth and waking up all your taste buds and senses. If aliens came to earth and demanded a great wine, they would take 82 Latour! Wine doesn’t get better than this! Cassis, tobacco, coffee and smoke aromatics jumped from the glass. Very tannic. Extraordinarily concentrated. You could spend all night counting the layers of fruit in this wine. Obviously, very complex. This is a huge wine. Every single taste receptor is awakened by this wine. Layers of ripe, decadent fruit cascade over your palate. My notes say, simply amazing! If wines could be awarded over 100 Pts, this could be it. When this sleeping giant becomes fully awake sometime in the next decade, it might be the wine of the vintage. A perfume of coffee, licorice, herbs, cedar, chocolate and cassis is easy to find. Dense, palate filling with sweet, ripe tannin to resolve. Deep, multiple layers of opulent, silky, ripe, fruit cascade and glide across your palate. Amazingly soft, lush and open. But as sublime as it is now, don’t let that fool you. It’s holding it’s best charms in reserve. This is an old school style of Bordeaux which is more interesting on the nose than the palate with its tobacco, cedar, lead pencil, cassis, cranberry, olive and wet earthy nose. It’s a little dry in the mouth, the tannins have a rustic quality. The wine feels firm on the palate in the slightly tart finish. Masculine in style, this cassis, truffle, cedar, earth and spice scented wine was very nice on the nose. On the palate, good weight with flavors of spicy black fruit. But, the finish was a bit short and had a slight bitter or sour note on the end. This wine has slipped past its prime. If you have any in your cellar, drink up as it will not improve and will continue losing fruit. Masculine in style, this Latour seems to have misplaced its fruit. Nice nose of cassis and earth, but the palate was short, tannic and displaying a bit of sour fruit in the finish. 78 Latour was much better 5 years ago, and even better 5 years before that. This wine needs to be drunk up in the near future. Cassis, licorice and wood on the nose. Medium bodied with very cabernet tasting fruit, this is not improving and is slowly drying out. It lacks the elegance and density to make this a very good wine. The finish displays less fruit than it should and ends with dry notes. Drink up. You’re greeted by a muted nose that takes a lot coaxing to find much in the way of its aromatics. Light in color, medium bodied and getting tired, the wine ended with a spice, earth and red fruit dominated finish. Firm, masculine and old school in style, the wine offers what you'd expect in an older Pauillac, with its cassis, lead pencil, tobacco, cigar box and earthy character. There is depth to the fruit, along with some roughness to the tannins, but that does not take anything away from its charm. The wine is mature and ready to drink. This bottle was decanted about 2 hours before serving, which helped soften its tough nature. Much better on the nose than the palate with its tobacco, smoke, earth and cassis profile. There was an element of cold steel along with its hard, austere, brawny profile. Masculine in character, and still tannic, the wine lacks the charm and polished elegance that is often found in Latour. While it’s popular to claim vintages like this need time, at close to 40 years of age, it is, what it is. 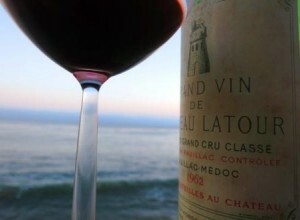 Granted, I’ve tasted better bottles, but it’s a vintage of Chateau Latour I’d look to buy today. On the bright side, with this much tannin remaining, there is no hurry to drink it. Iron, smoke, cassis, cigar wrapper, ceddar and forest scents combine with a powerful, beefy, tannic and masculine styled wine. Beefy and brawny, this old school styled wine is in its prime. 1975 Latour offered truffles, tobacco, cassis, blackberry, cigar and earthy aromas. Lean and angular, this austere wine lacked charm. I've tasted better bottles of this wine, but it's not a wine I'd buy a case of, hoping for a great Latour experience. Very tannic, IMO, more tannin than fruit. Lacking in elegance,with an austere texture. I had this wine twice in a few week period, this note is from the better bottle. With the mature notes of tobacco, cedar, stone, and cassis, there was also a floral note that added to the complexity. Fresh, filled with charm and Pauillac essence, this is a great vintage of Latour as it offers character and a mature Latour experience for a reasonable price. Reasonable for a Latour that is approaching 50 years of age. 1971 Latour pops with gravel, smoky tobacco, cigar ash, cassis, blackberry, cedar, lead pencil, kirsch, black raspberry and forest floor scents. Full bodied, powerful, concentrated and broad shouldered, the wine ends with a long, spicy, krisch filled finish. This was the finest example of 1971 Latour I have ever tasted! This fully mature Pauillac was smoky. BBQ aromas coupled with tobacco, truffle, cedar, forest floor, cassis and dark berries were easy to find. Old in style, this rustic feeling wine had charm, but it was a bit curmudgeonly in dishing it out. This will not improve. If you have more than a bottle or two, drink up. Note, I have tasted better bottles, but it is what it is. Still, there was something going worth paying attention to. The rustic, firm, slightly strict masculine, yet refined Pauillac sensibility was all there. Tobacco, cassis, cedar, lead pencil, earth, smoke and cigar wrapper notes turned the nose into the best part of the wine. Bottle variation is to be expected with wines that are 45 years of age. We were more than lucky with this bottle as it was the best example of 1970 Latour tasted in ages. Cedar, tobacco, cassis, cigar box and ash aromatics were all over the place. The wine was still fresh, the tannins were resolved and the finish combined hints of rusticity with elegance, it was long and the fruit was sweet. There is a fresh and lively quality to crisp, crunchy cassis fruit that I quite like, But there is a stern quality to the tannins, coupled with an austere quality to the leafy, tapenade and red fruit in the finish that detracts. I think this was probably not a perfect bottle, as it was good, but more old school than I recall based on how the last bottle I tasted showed. One of the best bottles I've tasted in years, the developed nose offers wet earth, tobacco, burning wood, cedar, stone, cassis, cigar wrapper and cherries. There is a slight tart edge to the fruit with some herb, cedar and forest floor notes that tasters who do not truly enjoy old school Bordeaux at its best, could find off putting. There is probably no real reason to hold this wine any longer, even though there is no hurry to drink it. Once again that chestnut of wisdom rang true, “After 20 years, there are no great wines, just great bottles.” I’ve enjoyed better bottles of 1970 Latour and I’ve tasted worse examples, this was in the middle. Still dark in color with bricking around the edges, the nose was packed with cedar, gravel, tar, blackberry, earth, cassis and tobacco scents. While the wine was powerful and concentrated, there was a touch of bitterness in the tannic finish. Was it the wine, or the bottle? There’s only one way to know for sure and that’s to pop another bottle. Cedar wood, tobacco, forest floor, cigar box, black currant, iron and truffle started off the mature aromatics. Full bodied, concentrated and showing depth of flavor, the wine ended with a refined, masculine, classic, long, spicy cassis finish. Depending on how the wine in question shows, bottle variation is either part of the fun, or the most frustrating aspect of the hobby. In this case, is the 1970 Latour a tannic, masculine, asutere styled wine? Or is it a powerful, refined Bordeaux with true Pauillac character? Bacchus was with us, because this was the best 1970 Latour I've had in ages! Crushed gravel, cassis, tobacco, smoke, truffle, blackberry, walnuts, forest floor and 5 Spice aromas were all over the place. Big, dense and chewy, this powerful Bordeaux wine commanded your attention. Most of the tannins have faded and this wine has developed wonderful complexities. It's not shy. Instead, it's power with refinement in a glass. Depending on the bottle, this could improve with age. Deep ruby color. Exotic oriental spice. coffee, cedar, mocha, leather, soy and intense mineral essences topped off with sweet caramel flowed from the glass. This wine is huge, balanced, masculine in style, but dapper as well. This mature claret offers a big, juicy mouthful of rich, ripe cassis, black cherry and iron. A slight bitter note hits the back of the mouth in the finish. Wow, nothing hits the spot like a great, mature Bordeaux. Dark, ruby with light edges. Notes of tobacco, cherries, cassis, wood, spice and earth fill your senses. Great mouth feel and texture. Long, slightly dusty finish in the beefy wine. Very serious juice! It had a huge nose of black fruits, cassis, cedar and walnuts. It was fat, rich and had a finish that wouldn't quit. Still young, vibrant and full of life. Great wine! Much better than the previous bottle from last year. Full bodied, concentrated, a bit rustic with loads of cassis, hints of cranberry, tobacco and cedar. Someplace between brawny, chewy and refined, this is at peak, showing what great classic Pauillac is all about. Not the best bottle of this I have ever had. Still, the tobacco, earth, herb, cassis, and cigar box notes were divine. It was the pyrazine notes that intruded. With this bottle, on the palate, the wine showed a distinctive green pepper note that some folks, longing for the days of unclean, peppery notes in the Bordeaux are going to love. The brawny finish was long, with more peppery notes. Classic in style, but in a good way, the wine combines rustic masculinity with cedar, tobacco, cassis, cigar wrapper, smoke and spice. Full bodied, long and with intensity, this bottle was very good, but perhaps not as good as other examples I've been fortunate to taste. Full bodied, powerful, concentrated, regal, in an old school classic manner, with a blast of cassis, tobacco, cedar chest, forest floor and blackberry. Mascuiline, with complexities and vibrancy, this bottle seemed immortal and might have deserved an extra point. Clearly, this is mature, but well-stored bottles should be great for another few decades or longer. There is a reason why people covet, cellar and pay for great, mature Bordeaux. If you want to know why this has been going on for centuries, 1966 Latour could be the wine to explain it. The incredible nose, with its tobacco, cigar box, cedar chest, pipe tobacco and dark cherry perfume really lights you up. The wine is deep, full bodied, concentrated, long and complex, with a fresh, spicy cassis driven that is hard to forget. This is the perfect combination of regal and masculine in a mature Bordeaux. This is all about the cassis, leather, cigar box, cedar wood and smokey, truffle scented nose. Powerful, regal, but not exactly refined, the wine has character, style and class. Fully mature, perfectly stored bottles can last for at least another 10, 15 or 20 years, but I doubt they will get better. Still young as it approaches its 50th birthday, the perfume is loaded with truffles, Cuban cigar, cassis, cedar chest, walnuts, spice, damp forest floor and tobacco. Concentrated with fruit and still tannin, the wine fills your mouth with a long, powerful, spicy, cassis filled finish. Deeply colored, massive and concentrated, this was loaded with ripe cassis, black fruits, tar, smoke and cedar. This wine perfectly marries power with grace in an old school style. 66 Latour offers cedar, truffle, cassis, walnuts, forest floor and tobacco notes. This powerful, structured wine is a little on the rustic side with slightly rough tannins. The wine ends in a long cassis filled finish that is slightly marred by some tart sensations. I've had better examples of this wine. But you know what they say about bottles with more than two decades of life... There's no such thing as a great wine, only great bottles. A bit austere in style. Almost a bruiser for Latour. Cassis, lead pencil and earthy tones on the nose. Very full bodied. The finish was a bit clipped. I liked the finish as it still showed fruit, but, its shortness bothered all of us. The wine sports a deep, ruby color with a nose screaming old Bordeaux! Wet forest smells with exotic spice, leather, black fruit, tobacco, truffle and cassis fill the air. And that’s without swirling! This dense, full-bodied, old school styled wine is still not fully mature. Tobacco, cassis, blackberry, spice box, herbs, wet earth, cigar box and fresh cherry aromas create the perfume. The wine is medium bodied, straddling the middle ground between finesse and austerity with a hint of green notes, the wine ends with a spicy, cassis and cranberry finish. Better on the nose than the palate, this is still quite charming. However, this is not a wine to hold for future development. This bottle was good, but sadly, not great. Better on the nose, with its tobacco, cigar box, herbs, forest floor, cedar chest and cherry notes than on the palate, which was starting to fade. Other bottles have been better. Regardless, tasting Latour with more than 50 years of age is always a treat. What a stunning performance for this great wine, from a forgotten vintage. Cigar box, ash, cedar, truffle, forest floor, spice, cherry jam and tobacco notes scream from the glass. Full bodied, soft, round, potent and very much alive, this is a great example of iron fist in the velvet glove. I've been lucky to have tasted this winner 3 times over the past 12 months, and each bottle has been delicious. If you cannot afford the legendary 1961 Latour, (And who can?) if you're seeking an old school Latour that is fully mature, this is the wine to buy! It’s been years since I’ve tasted this wine. On its 50th birthday, I had no idea what to expect. While my hopes were high, there was no way I could have imagined how good this wine was going to be! The thrills started with the complex aromatics; smoke, Asian spice, cassis, walnuts, blackberry, lead pencil, cedar chest, tobacco, strawberry and forest floor were ample to keep a taster interested. But the show continued all the through to the finish, with rich, supple, regal textures and a long, sweet, soft, generous black and red fruit filled finish that continued improving in the glass. From a bottle that came directly from the chateau, this was a beauty! The iron edge to the bright cassis was complicated by the tobacco leaf, cigar box, dark chocolate, cedar and sprig of mint on the nose. On the palate, the perfect melange of power, austerity, regal character and freshness carried through to the bright, sweet, earthy, stony red fruits. Here you find elegance married to power. What a wine and what a treat! The 61 was the product of the lowest yields in the history of the estate at only 15 hectoliters per hectare. Interestingly, the wine spent 3 years in barrel before bottling. 1961 Latour offers a regal perfume of tobacco leaf, cassis, iron, cedar, spice, truffle and forest floor notes. Powerful, full bodied, intense and deep, this concentrated wine takes over your palate with multiple layers of rich, ripe, spicy black fruits that fill your mouth and coat your palate. This wine personifies the term "iron fist in a velvet glove." This is elegance meshed with power. The long, spicy, dark berry and cassis filled finish remains in your mouth for close to 60 seconds. After hours in the glass, the wine continued putting on weight and evolving in the glass. Absolutely amazing! This huge wine was packed and stacked with countless layers of rich, ripe, Cabernet fruit. The walnut laden perfume with it’s layers of cassis, cedar and truffles was off the charts. It tasted incredibly young and will continue to improve for decades. The initial sniff from the gentle, first pour was all it took to know this bottle was special. The complexity and depth on the nose was mind-blowing. But on the palate, the wine offered a supple, lushness, layers of cherry and cassis, tobacco, spice and cedar that would not quit. Multi-faceted, each sniff and sip offered something new. Popped and poured, the wine remained at this high level until it was drained from the glass. The best bottle of the 59 Latour I have ever encountered. I am sure this is a preview of the 82, or 09 will morph into, except those vintages will be even better with equal amounts of bottle age. Shockingly expensive, but if you have the discretionary income, this was an unequaled tasting experience. The nose on this was better and more interesting than the palate with its blend of truffle, cigar box, earth, forest floor, dark red berry and spicy scents. Full bodied and concentrated, with a great depth of flavor, this bottle was a little dry in the finish which detracted from the overall experience. With older vintages, it's all about the bottle and sadly, this bottle was good, but a perfect example of what can be an other worldly tasting experience. Looking at this wine, you'd think it was 20 years younger! The bouquet of aromas filled the air with cigar box, ash, smoke, tobacco, rocks, blackberries, cherries, spice and truffles. The wine is rich, intense, full bodied, long and ends with layer of silky, deep, sweet and slightly tart spicy cherries. This thrill a sip wine was a treat! Off the charts! The intoxicating, spicy, cassis, tobacco and truffle perfume filled the glass, your senses and the room. This was very concentrated, offering endless layers of deep, rich cabernet fruit and a long, intense finish. Not as big as the 61, but more opulent in style. This is why people age and cellar top Bordeaux wines in the best vintages. Showing deep ruby color with slight lightening at the rim. Cassis, spices, cedar and walnuts. Dark, deep, dense and concentrated. Lots of ripe, juicy Cabernet quality in this stunning Bordeaux wine. Dark in color, when you keep the vintage in mind, tobacco, cedar, smoke, pomegranate and cassis scents are the best part of the wine as it offers little fruit or complexity. Drink up. Fully mature, the wine opens with a spicy, smoky nose complicated by tobacco, cigar box, cassis and cedar wood. The tannins have a bit old school rusticity in the texture. The wine ends with crisp red fruits, herbs, earth and spice. I understand holding the wine for a birthyear or anniversary. But if you are not waiting for specific date, if you own a bottle, I would drink it, instead of aging it longer. Filled with truffles, spicy black fruit and cassis, leather, smoke and soy scents in the perfume. Offering a big mouth feel in an old school austere style, this wine served up a healthy dose of cassis in the long syrupy textured finish that's only found in old, mature wines. The wine kept improving in the glass. Provenance is everything in wines. This bottle has barely moved since the day it was produced. It is always a treat to taste perfectly mature, older Bordeaux, especially when it is a vintage of Latour, I have never tasted. Medium bodied, refined, soft and with that great blend of forest floor, cedar wood, tobacco, wet earth and spicy, clean, red fruits. The wine seems to have exchanged power with charm. I wish the finish was a bit longer, but this was still a treat. The best bottle of 1949 Latour I have ever tasted! It took about 30 minutes before some of the initial stern character morphed into a regal, classic, Pauillac with a heavy dose of cedar, some pyrazines, tobacco leaf, ash, earth and cherry. Full bodied with depth, this almost 70-year-old Latour was a treat. Cedar, truffles, grilled red berries and smoke in the perfume. Perhaps a touch of VA. Blackberries and a touch of tartness marred the delicate finish. Slightly acidic. Truffle, tobacco, earth, cassis, Asian spice kicked off the perfume. But the wine did not develop well in the glass. It lost fruit, weight and balance while gaining in acidity and tart flavors after 20 minutes in the glass. The wine showed best during its first 15 minutes. Served double blind, this stunner was soft, supple, round and packed with spicy cassis, opulent sweet cherries, tobacco, truffle and cigar box. Brick red in color, the finish was long, clean and impressive. Concentrated, stern and with some, old school rusticity in the tannins, the burning wood, tobacco, lead pencil, cigar box, cassis and smokey notes sang, but the tune would have been better without the VA. Full-bodied on the palate, the wine had a presence, but it was on the older, more stern side of the style range, with a combination of sweet and tart red fruits and salt in the finish. From a bottle that still held the original cork and a fill that was correct for being almost 80 years of age, this bottle was a poor drinking experience. The nose combined old cigarette, tobacco and ash aromas, but not fruit. On the palate, the wine was better than just wet, but just barely. Oh well... Another piece of bottled history down the drain. I've heard that good bottles of the 1937 provide great drinking. If you have a bottle, I hope it turn out better than mine. Clearly, this is the wine of the vintage. This bottle was perfect as it has not moved from the chateau since it was bottled! Tasting decades younger than its true age, the wine continued building in intensity and fruit over the hours it remained in my glass. There was a beautiful ourity to the sweet, ripe cherries that remains etched on my palate. The nose was all about the tobacco, cedar wood, cigar box, spice and truffle personality. What a thrill it was to taste bottled history! Not quite close to dead, but on its way in the near future. The plush texture could be enjoyed, but the whisky and maderized elixir was far too gone to be of more than historical interest. Still, it was an honor to be able to experience the wines last gasps of breath. This example proved the no great wines, only great bottles theory. Dried orange peel, spices, minerals, cedar and walnuts. Incredible mouthful of gorgeous rich, ripe, sweet fruit. Perfectly well balanced. Deep, multiple layers of syrupy, ripe fruit glide over your palate as easily as clouds swim across the sky. This was absolutely compelling. The wine continued improving in the glass. It was impossible to put it down and stop tasting or smelling the wine. How I managed not to reach across the table and start drinking from other peoples glasses, or at least beg for more is beyond me. 1929 Latour is the perfect example of the iron fist in the velvet glove. It is hard to believe this is the second time I've tasted this scarce wine. But it's true. Light in color and weight, it was easy and effortless to drink down its tobacco, cedar, spice and leafy character. The lightweight finish that delivered the remaining vestiges of fresh red fruits had charm. Served blind, I was shocked to discover this was 100 years old! And I was even more surprised to see the came from what I considered a weak vintage. From an original bottle with the original cork, the wine was light, the color was similar to rosehip tea. On the palate, the wine was elegant, fresh and feminine. The bouquet, with its spice, cigar wrapper, smoke wet earth and forest character was great. The finish was all about the soft, refined nature coupled with the remaining sweetness in the leafy, ripe, cherry finish. This was a treat I am not going to forget. Packed with cassis, cedar wood, gravel and tobacco, cherry, black raspberry, forest floor, truffle and smoke, this medium bodied, soft, lighter, red cherry filled wine had a lot going on for a wine that was about to celebrate its 100th birthday! This had a light, rusty, orange color with scents of earth, leather and tea. Syrupy texture with strawberry, raspberry tea flavors. Short finish. Fruit faded in the glass. Yes, do not adjust your screen, that was 1899 Latour! Light brick color, a touch of VA. Spice, coffee, chocolate and toffee in the nose. The 110 year old Bordeaux wine had a finish that improved in the glass over the entire night left me with a memorable Bordeaux experience. Some people at the dinner spit. I can promise you, I put that wine where it belonged, finishing my entire pour!